Angelina Jolie (b. 4 June 1975 – ) is an Oscar-winning actress, movie director, humanitarian and global celebrity. She rose to fame through her title role in the film “Lara Croft”. In recent years, Jolie has moved into film production, acting as director, writer and producer. She has six children, three of whom are adopted. She serves in a capacity as a Goodwill Ambassador for the UNHCR. 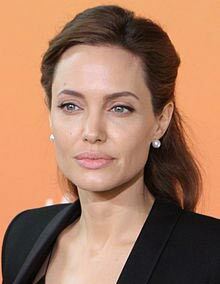 Angelina was born in Los Angeles, California. Her parents, Jon Voight and Marcheline Bertrand were actors, and this was a significant influence on her early life. When she was eleven, she enrolled at the Lee Strasberg Theatre Institute and performed in several theatre productions. This early training was important to her philosophy of acting. A major component of this acting school is to stay in part for the duration of the filming – taking on the characteristics of her characters. She later studied film studies at New York University. Aged 16, she temporarily tried modelling and appeared in some music videos. However, this career did not take off. Ironically, for someone who would later be cited as the world’s ‘most beautiful women’, Angelina had difficult periods in her childhood. She recounts being picked on by other children for being very thin and wearing glasses. In 1993, she began her professional film career with her first major part in the sci-fi film ‘Cyborg 2’. Several roles in smaller films followed with Jolie receiving critical praise, though the films did not go on to be major successes. In 1997, she received her first Golden Globe Award for her performance in ‘George Wallace’ (1997). She played the second wife of Alabama segregationist governor – George Wallace. In 1998, she starred in a biopic about Gia Carangi, a supermodel who struggled to deal with her fame and success – dying prematurely from AIDS as result of sharing drug needles. Jolie was praised for her performance; however, to perform the character she adopted ‘method acting’ and took on similar characteristics to the role she was playing. As a result, she became difficult to deal with, especially as there were some parallels with Jolie’s own struggles with depression. In 1999, she starred alongside Denzel Washington in the successful film ‘The Bone Collector’ (1999). Also in that year, she played a woman who spent time in a psychiatric hospital in ‘Girl Interrupted’ (1999). Her performance won her the triple crown of Golden Globe Award, the SAG and Academy Award for the best leading actress. Jolie was gaining a reputation for producing strong acting performances, and she became increasingly in demand. Her growing acting profile also led to increased media interest, especially because of her physical beauty and colourful life. In 2000, she was chosen to play the lead role in ‘Lara Croft: Tomb Raider’. This was by far her most successful film commercially, becoming one of biggest grossing films of the year. The role involved considerable physical training to play the adventurous and athletic character. (often said to be a cross between James Bond and Indiana Jones. Filming ‘Lara Croft’ in Cambodia, caused Jolie to become more interested in humanitarian activities. She became an active participant in her role as United Nations High Commissioner for Refugees (UNHCR). She has travelled extensively to areas such as Darfur, Sierra Leone and Afghanistan. In 2012, she was appointed Special Envoy to High Commissioner Antonia Guterres. Jolie says she puts a third of her salary into savings, a third for living expenses and gives the final third to charity. Jolie has become an advocate for children’s education and protecting the interests of child immigrants and other vulnerable children. She has also worked with the Education Partnership for Children of Conflict and has helped to establish education policies. In January 2011, she established the Jolie Legal Fellowship a network of lawyers who are sponsored to advocate for human rights in developing countries. After she had devoted more time to humanitarian work, her public profile changed from an image of a ‘wild child’ to a more positive image. In 2004, Jolie began filming Mr & Mrs Smith (2005) with Brad Pitt. The film was noted for its on-screen chemistry between Jolie and Pitt (who was at the time married to Jennifer Aniston) Pitt later divorced Aniston and in 2014 the couple married. However, in 2016, the couple separated. Jolie has become one of the highest-paid actors in Hollywood. Her films are regularly commercial and critical successes. With Jolie’s performances often being the stand out performance. In 2007, she began her directing career with a documentary ‘A Place in Time’ (2007). Her full feature debut was a film ‘In the Land of Blood and Honey’ (2011) a love story set in the Yugoslav civil war between a Serb soldier and a Bosniak prisoner of war. She used only actors from the former Yugoslavia, and the film was a critical success. In 2014, she produced her second film ‘Unbroken’ about a World War II hero Louis Zamperini. Jolie admits she has a great interest in war movies, but was also attracted to tell this remarkable story of heroism and personal strength because of the personal qualities of Zamperini. In 2013, she had a preventative double mastectomy to reduce her risk of breast cancer. She wrote about her experience and choices she made, which she wrote about in a New York op-ed. Her doctors told her that her genes left her an 87% chance of developing breast cancer. Her mother, Marcheline died from Ovarian cancer. Jolie explained her decision to take preventative action. Jolie remains one of the highest paid film stars and is one of the best-known celebrities. This has led to highly paid endorsements, such as for a single Louis Vuitton production, which led to the payment of a reported $10 million. adopted March 15, 2007.Zahara Marley Jolie-Pitt – female, born January 8, 2005 – (Ethiopia) adopted July 6, 2005.Shiloh Nouvel Jolie-Pitt – female, born May 27, 2006 – NamibiaKnox Léon Jolie-Pitt – male, born July 12, 2008 – FranceVivienne Marcheline Jolie-Pitt – female, born July 12, 2008 – France.